United Regional is recognized in Wichita Falls and the surrounding communities for providing advanced technology and high quality care. When it comes to injuries, United Regional serves as the primary trauma-receiving center for an area with a population of more than 250,000. We are honored to announce our verification of a Level II Trauma Facility from the American College of Surgeons, a graduation from designation as a Lead Level III Trauma Facility in 2003. This achievement recognizes United Regional’s dedication to providing optimal care for injured patients and substantiates that we provide not only the resources necessary for trauma care, but the entire spectrum of care to address the needs of all injured patients, from the pre-hospital phase through the rehabilitation process. The verification also makes United Regional one of only three Texas Level II Trauma Centers located west of the I-35 corridor. 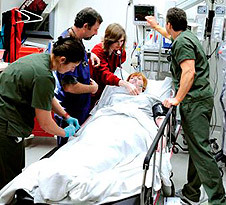 The process of becoming recognized as Level II is rigorous and required a detailed review of many departments: the Emergency Center, Operating Room, Recovery Room, Critical Care units, Surgical unit, Blood Bank, Lab and Radiology. The review also included an evaluation of medical records and performance improvement and patient safety processes. It is reassuring to know that exceptional trauma care is so close to home. Trauma patients come to United Regional from all over the region and this reflects the organization’s commitment to deliver excellent care to the injured. The American College of Surgeons verification affirms this. In 2015, over 70,000 patients visited United Regional’s Emergency Department and 617 of these patients were seen due to injuries from motor vehicle collisions, falls, cuts, penetrations and burns. In the U.S., injuries are the leading cause of death in children and adults ages 1 through 44. Because of this stunning statistic, it is vital that community hospitals provide a high level of trauma care in the communities that rely upon them.